TesCar was established in 1976 in Osimo, Italy. Focusing on the construction of hydraulic drilling rigs for micropiles and soil investigation, TesCar has the contractor in mind. TesCar stands above its competition by developing machines that are adaptable and can be configured to complement any specific work environment. 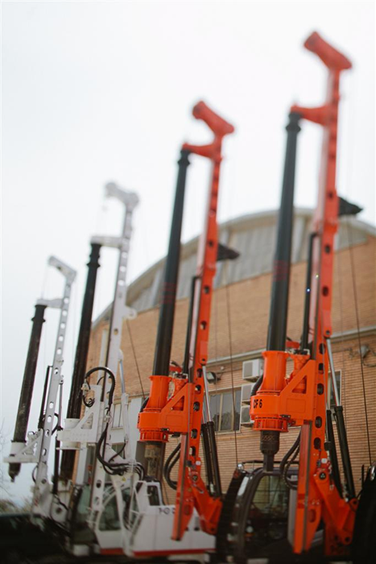 In 1985, TesCar was the first to introduce to the market mini-piling rigs for drilling foundations, known as the CF Series. These machines are capable of working in limited access and narrow spaces. Over the last 5 years TesCar has improved and developed all its piling rigs replacing the undercarriages with the latest and most reliable excavator bases such as Hitachi, Caterpillar, Bobcat, Kubota, Komatsu, and Eurocomach along with adding brand new crawler bases entirely manufactured by TesCar. Over the last 37 years TesCar has evolved to become the leader in the production and sale of small/medium sized piling machines through continuous research and understanding the needs of its customers. TesCar has been nicknamed “The Tailor Rig Maker” as it always welcomes its customer’s requests for customized rigs. If you’re looking for a piling machine that has been created with care, attention to detail and the customer in mind then TESCAR should be considered for its performance, customization and affordability.